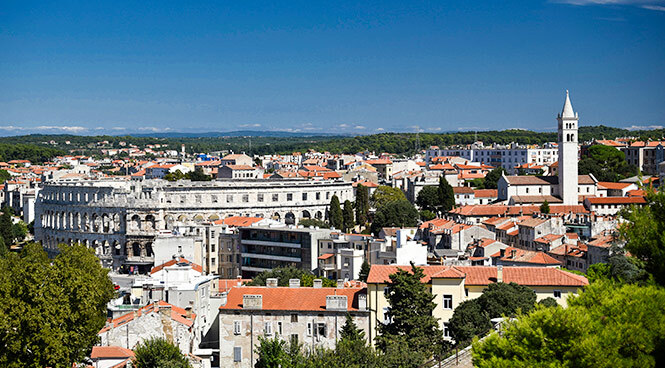 Pula is another beautiful spot from which to enjoy Istria’s charms. The Pula Riviera is a great place to try water sports and the town of Pula itself is home to an ancient Roman amphitheatre, a fascinating aquarium, and numerous dolphin and whale watching tours. Remember that every villa we offer comes with a villa manual to give you all the info you need on local attractions, excursions and amenities.Pula is another beautiful spot from which to enjoy Istria’s charms. The Pula Riviera is a great place to try water sports and the town of Pula itself is home to an ancient Roman amphitheatre, a fascinating aquarium, and numerous dolphin and whale watching tours. Remember that every villa we offer comes with a villa manual to give you all the info you need on local attractions, excursions and amenities. Pula resort has some wonderful beaches, excellent restaurants and shopping facilities as well as a number of other cultural attractions, in particular the large Roman Amphitheatre which plays host to a number of theatre and musical events. Pula is the largest town on the Istrian peninsula, offering a divers range of attractions for culture vultures. While strolling through this historical town, you will come across numerous monuments of Roman architecture: the Triumphal Arch of the Sergi, Hercules’ Gate and Twin Gates, the Temple of Augustus, Arena and the Small Roman Theatre. You can also enjoy a coffee at Caffee Uliks, made famous by the Irish writer James Joyce – you’ll understand exactly why he fell in love with Pula. Fazana is a picturesque fishing town on Southwest Coast of the Istrian Peninsula situated near to the ancient town of Pula. Great for families with children, there’s many beautiful beaches here. For food lover’s there’s a choice of many numerous good quality restaurants and for nature lovers the beautiful seaside promenade where everyone can enjoy the sea air or enjoy watching the sunset. You can also get a boat to the famous Brijuni Islands National Park. Galizana is small village and is known for being one of the oldest in Istria, located inland on the old road that goes from Pula to Vodnjan. It’s home to one of the Istria’s biggest kazun’s – a circular stone house, typical of the region and offers some of the best fresh bread around! Vodnjan is another neighbouring town to Pula and will interest those who love art and culture. Walking around the old part of town you'll be surprised by the multitude of buildings from different periods: Gothic, Renaissance and Baroque. There’s also a castle and church to visit.